Google Chrome web browser holds 59% browser market share. Google is search engine giant with its version 68 of Chrome browser has rolled out an update that started to flag all non-HTTPS websites as ‘Not secure‘ from today. It means Chrome browser will warn user when they visit HTTP site by indicating “Your connection to this site is not secure” in the address bar. That is why, there is a risk of losing customer trust means lose web traffic and drop in search engine ranking. One among Google Chrome core values is to provide high-end security to support digital well-beings for its users. The company has always been in the news rolling out new tools and features that make lives easy for everyone, from towering corporations to individual users. Security is a top priority for Google since day one. And, it is all set to get better. 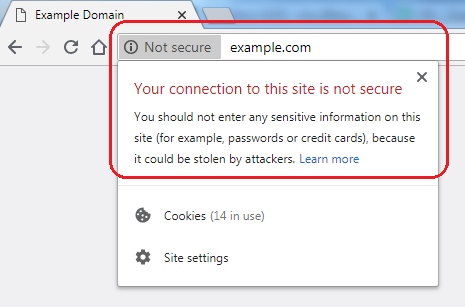 Starting in October 2018 with the release of Chrome (70), Google plans to mark HTTP websites as red ‘Not secure’ warning with a red-triangle icon with a white exclamation mark next to site address instead of the small (i) button near the “Not secure” notification, when user enters data on an HTTP page. All of this leads to one conclusion. There is no more escaping the need to have HTTPS on online business website. The problem with HTTP websites is that it gives hackers the loophole to manipulate the information exchanged between a web browser and a web server before it reaches the intended recipient. HTTPS (HyperText Transport Protocol Secure) is an secured version of HTTP used to encrypt communication between web server and web browser. Google also encourage webmasters to adopt HTTPS connection using SSL certificate for their site, which helps to encrypt all of information transmitted across networks to make secure web. All this might make any online user aware of importance of HTTPS site. But, for larger enterprises, especially those working in the eCommerce space, banking, healthcare, etc. there is a need for in-depth authentication of website ownership and organization identity, legal existence status. It can be made possible only with the use of Extended validation SSL certificate issued by Certificate Authority for your domain. Well, we won’t be surprised if Google plans to no longer trigger “secure” indicator appears in web address bar on HTTPS site in September with release of Chrome version 69. Sites don’t have SSL certificates will trigger a red “Not secure” indicator when entering data on HTTP pages in October’s Chrome 70 version. Therefore, HTTPS adoption is mandatory to avoid “Not secure” warning. A large number of websites are adopting secure (HTTPS) connection using SSL certificate. Previous PostPrevious Free SSL Vs Paid SSL Certificate: Which is Best for You?